11 million Syrians have been displaced by the fighting; 6.6 million of those are internally displaced. 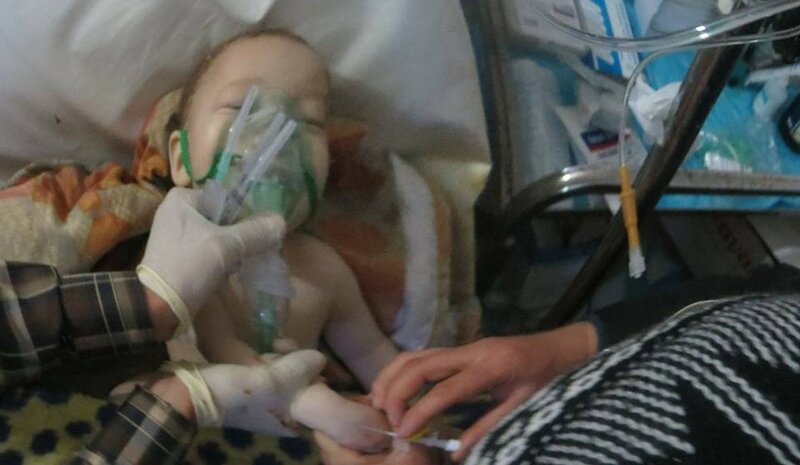 The use of chemical agents and attacks on medical facilities continue unabated. MSF supports more than 70 health structures across Syria. In March this year a Médecins Sans Frontières (MSF) medical team providing support to the emergency department of Bab Al Hawa hospital in Idlib province, Syria, confirmed that eight patients presented symptoms - including constricted pupils, muscles spasms and involuntary defecation - which were consistent with exposure to a neurotoxic agent such as sarin gas or similar agent. It is believed that the victims of the attack were exposed to at least two different chemical agents. Chemical attacks are adding to the suffering of the Syrian people – but are far from the only abuse they face. Since the beginning of the conflict, warring parties have been attacking civilian institutions with conventional weapons, including heavy artillery, cluster munitions, white phosphorus, incendiary weapons and the notorious helicopter-dropped barrel bombs. It has exposed hundreds of thousands of civilians to the severe deprivation of unlawful sieges. Syrian prisons have imposed ruthless conditions, pervasive torture and widespread death on thousands more. Yet the international community remains impassive. MSF teams denounced the use of chemical weapons in the civil war in Syria for the first time in 2013 when repeated chemical attacks were carried out in the besieged area of Ghouta, eastern Damascus, and approximately 3,600 patients presenting symptoms to exposure to neurotoxic agents were treated in three MSF supported medical facilities. Again, in August 2015, MSF teams on the ground treated patients very likely exposed to chemical agents. These patients were assisted at various MSF-supported hospitals located in the rebel-held northern provinces of Aleppo and Idlib. These terrible incidents have mobilised outrage globally (as well as of course a military response), but for the people of Syria suffering through this long war they are but a small part of the threat they face. The health system has largely collapsed, more than 15,000 medical doctors have fled the country, and vital medical supplies worryingly lacking across the country. Children die of preventable and treatable diseases like pneumonia. Women die in childbirth for lack of access to maternity care. These are not the deaths caused by barrel bombs or indiscriminate attacks by armed groups or regular armies, but they are no less the cause of war and no less the responsibility of warring parties to prevent. International humanitarian norms have been disregarded by the actors involved in the conflict. It is civilians that pay the highest price for this. In the case of such extreme violations of humanitarian law, humanitarian assistance simply cannot respond effectively. It is hard not to despair of finding political solutions. Even, any form of effective accountability for the many violations meted out by all sides in this conflict is hard to envisage at this stage. Repeated calls from MSF and so many other humanitarian or human rights groups for an end to abuses from all sides have not been heeded. The political, geo-strategic and economic interests that belligerents involved in the Syrian conflict are pursuing continue to take precedence over effective response to the catastrophic humanitarian situation unfolding. However, despite the difficulties, humanitarian action remains essential. MSF has been responding to the humanitarian and medical needs in Syria since the very onset of the conflict (although have never been given approval to operate on the government side of the front lines). This humanitarian response has been clearly representing one of the MSF’s foremost operational priorities for the last few years with an overall budget of more than AUD$30 million in 2016 only. Tragically, the challenges encountered in providing adequate and principled humanitarian assistance are immense and, in many instances, insurmountable for aid agencies responding to the crisis. Access to several areas across the country remains extremely complicated. Warring parties controlling the ground are imposing blockages to access communities in need and are making it utterly difficult for people to safely reach health structures. Current foreign policy from most key players remains fixated on defeating ISIS - an important initiative, but far from the main cause of Syrian deaths or suffering. Along with renewed efforts to broker a political solution, states like Australia and New Zealand - middle powers with a good track record on asserting humanitarian norms – must redouble efforts to ensure humanitarian standards are raised, humanitarian access is improved and populations on all sides can access relief. Relief outcomes need to be at the top of the international agenda whilst peace remains elusive. MSF is once again calling for an immediate cessation of the ongoing and blatant violations of international humanitarian law committed by the warring parties in the conflict in Syria. The repeated use of chemical agents and the indiscriminate attacks on civilian populations including medical structures must come to an end.